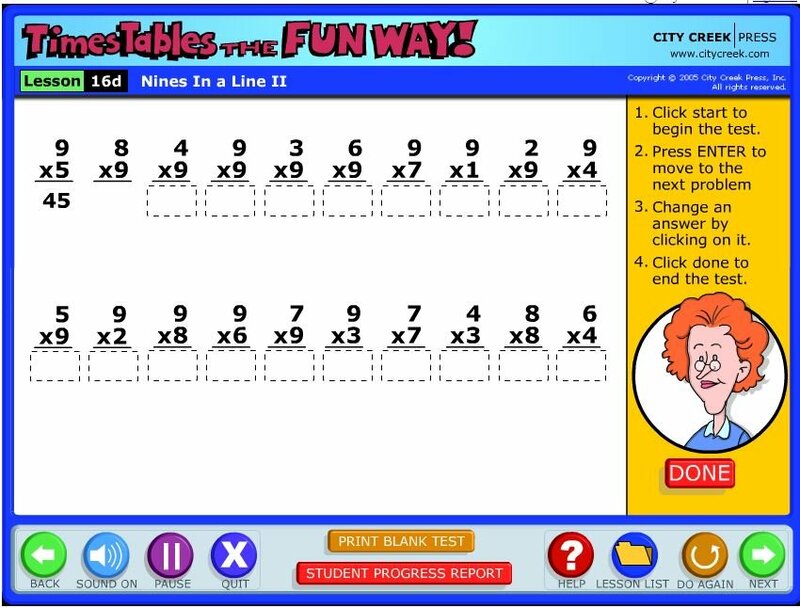 The chance to review Times Alive by Times Tables the Fun Way came at a perfect time, because Breeze is scheduled to learn her multiplication tables just about now. 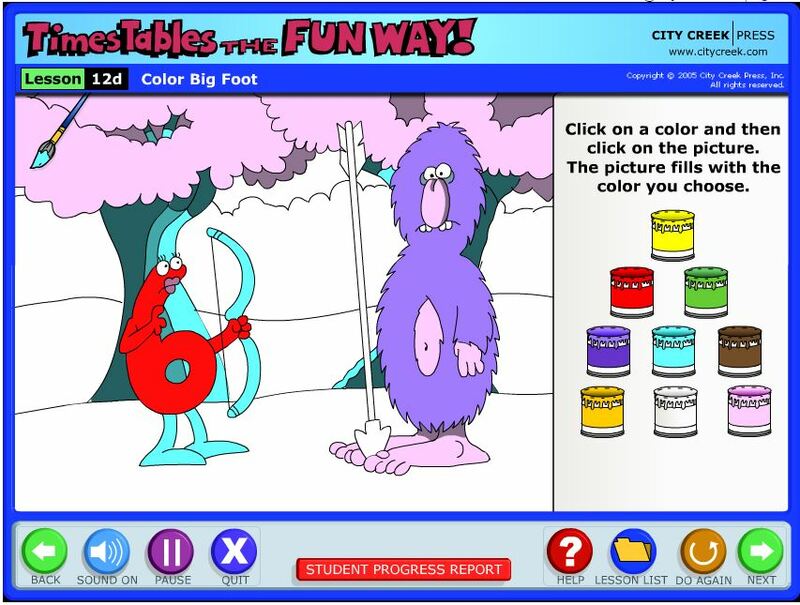 And who wouldn’t enjoy online lessons with animated songs and stories to learn times tables the fun way? 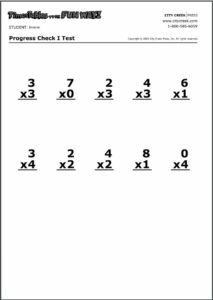 I learned the times tables the old-school way: you memorized them as much as you could, and then the teacher would make you stand at the front of the class and as you chanted, “One times one is one. One times two is two. One times three is three…” and so on. It could be excruciating waiting for your turn, and humiliating if you still haven’t gotten them perfectly memorized, standing in front and stuck on six times eight. So Times Alive is a pretty nifty alternative to that. 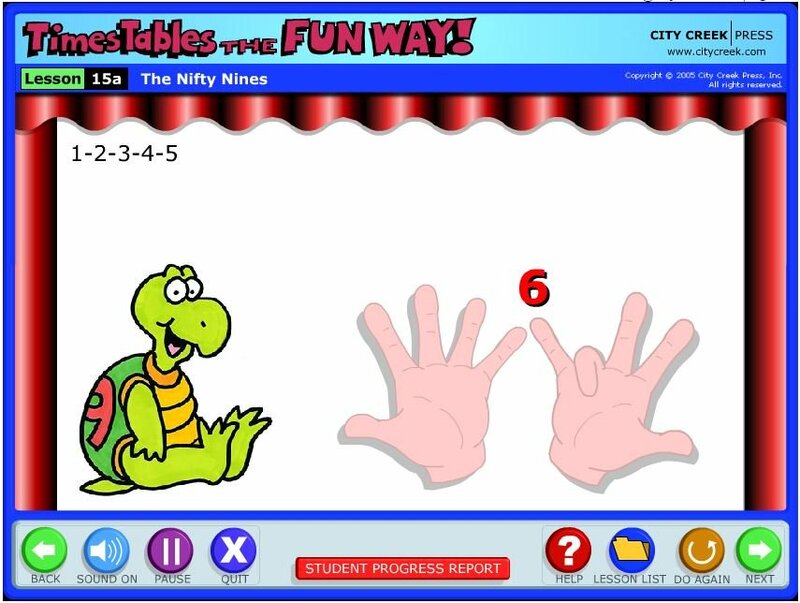 Times Alive is an online monthly subscription that uses animation, stories, songs, and interactive games to teach the multiplication tables, from 0 to 9. 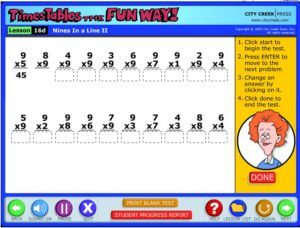 It is published by City Creek Press, and is one of the products under Times Tables the Fun Way. Times Alive costs $6.95 to set up, and has a monthly fee of $9.95. Six-year-old Breeze used Times Alive as a supplement for her Math class. 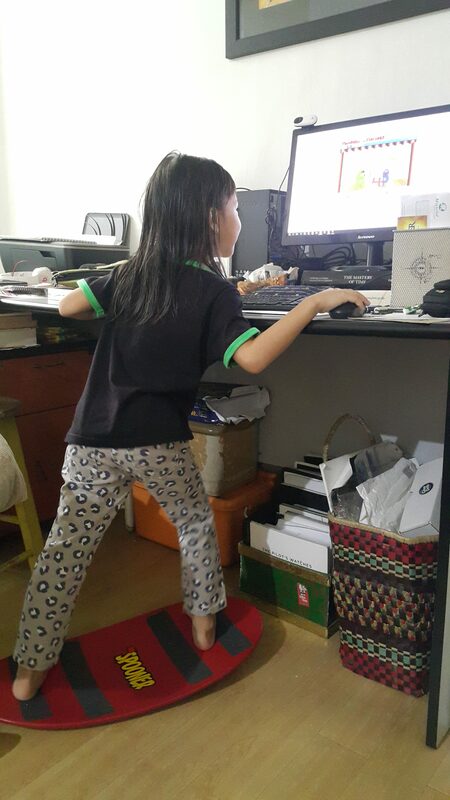 We had to set up Breeze’s student account first, then she could login and go on with her lessons on her own. 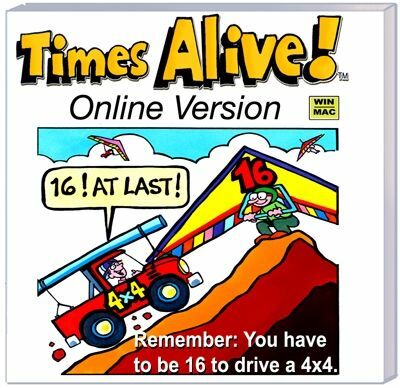 They recommend using Times Alive for at least 20 minutes a day, or one session per day at least twice a week. Breeze liked it so much that she would do a couple of sessions at a time, and would sometimes ask to do it daily. Raine would sometimes watch with Breeze, and I would hear them laughing over some of the silly antics of the numbers. 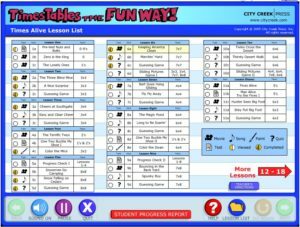 You can quickly see the lessons lined up, as well as what components (movie, song, quiz) are involved. Times Alive is straightforward and easy to use. 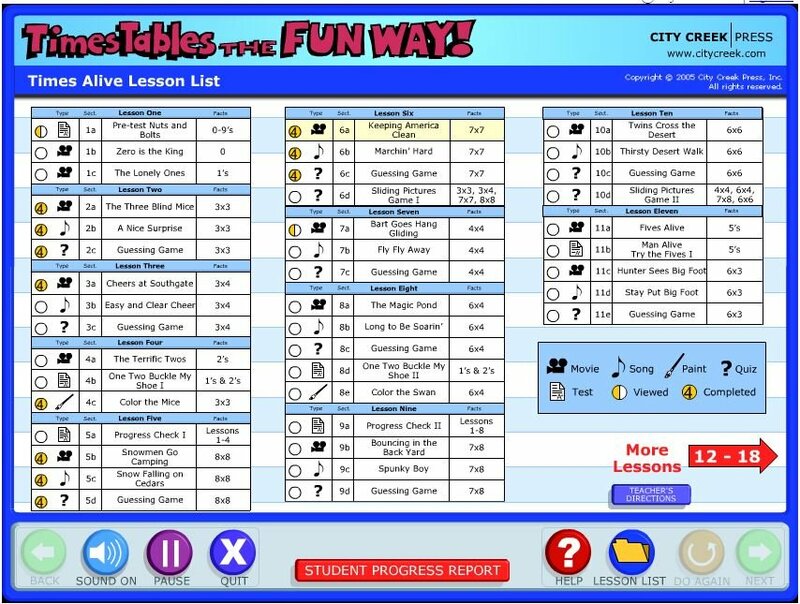 The lessons and progress checks are listed in a table. 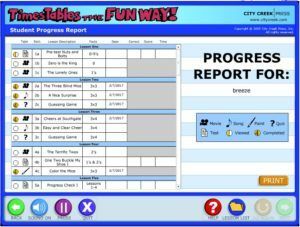 You can also view your student’s progress report, which also has icons to show if a lesson has a movie, a song, or a test. It will also show if the lesson has been completed or viewed, and if it is a test, there will be a score, the date the test was taken, and the length of time the test was taken. You can see which lessons have been viewed and completes, and you can monitor which tests have been taken, and what scores they had. The lessons are basically mnemonics—tools to help you recall something—that use pictures and silly stories and songs. 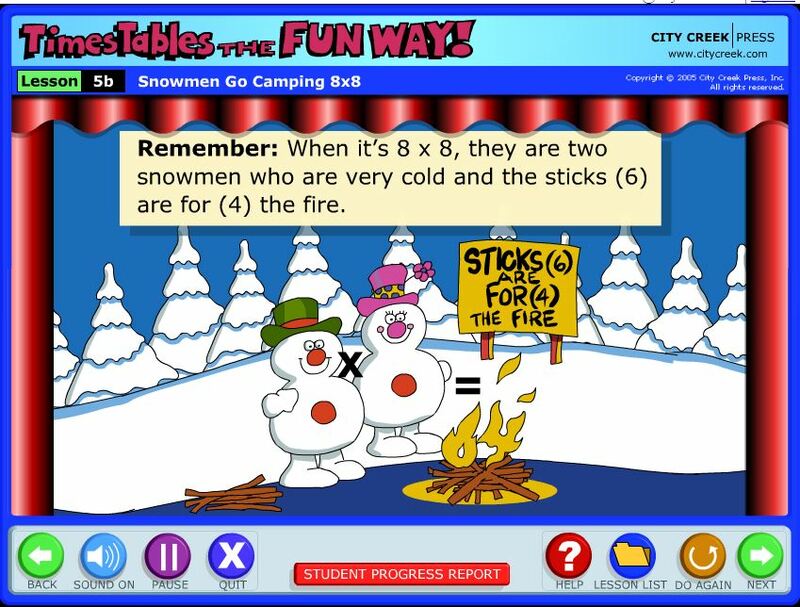 For example, for the 8x8 lesson, two 8-shaped snowmen are cold (duh!) and find sticks (sounds like 6) that are for (4) a fire. 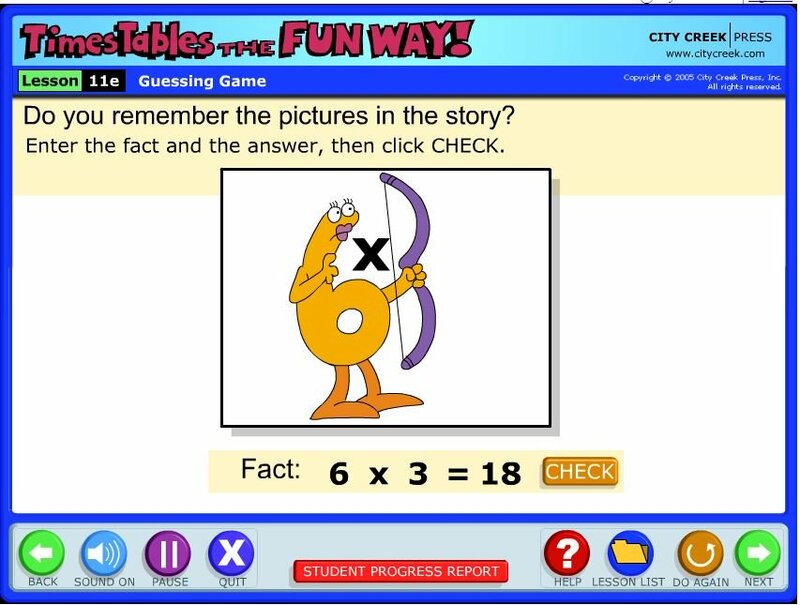 The cartoon shows 8x8 = 64 in the end (not outright—you still have to imagine things a bit). The other storylines include two 7 soldiers guarding a fort (4) that’s beside a sign that looks like a 9 (7x7 = 49); a kid who can’t wait to turn 16 so he can drive his 4x4 SUV (4x4 = 16); and twin 6s crossing the desert, so they become thirsty sixes (36). After the story, Times Alive explains the mnemonic. But does it work? I asked Breeze right now what eight times eight was, and she gave me that deer-caught-in-headlights look. 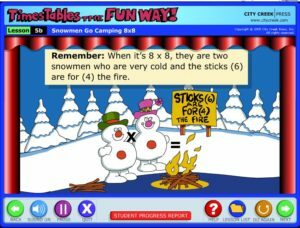 “Remember?” I prompted, “The 8 snowmen?” “Ah!” she said. “Sixty-four.” Then she went back to munching her toast. So it does work, if she remembers to remember her mnemonics! There are 18 lessons in all, and you start and end with a pre-test and a post-test. 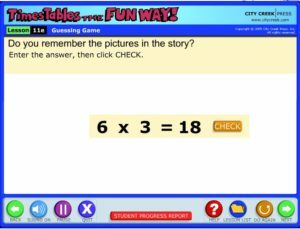 After each lesson is a checkpoint to see if the number facts were learned, and then after every four lessons, there’s a progress check that covers the past lessons. All Breeze has to do is log in (just type in her username), and then click on the lesson for the day. Then she watches the movie and the song. You can watch these over and over, if you want to, by clicking the ‘Do Again’ button. 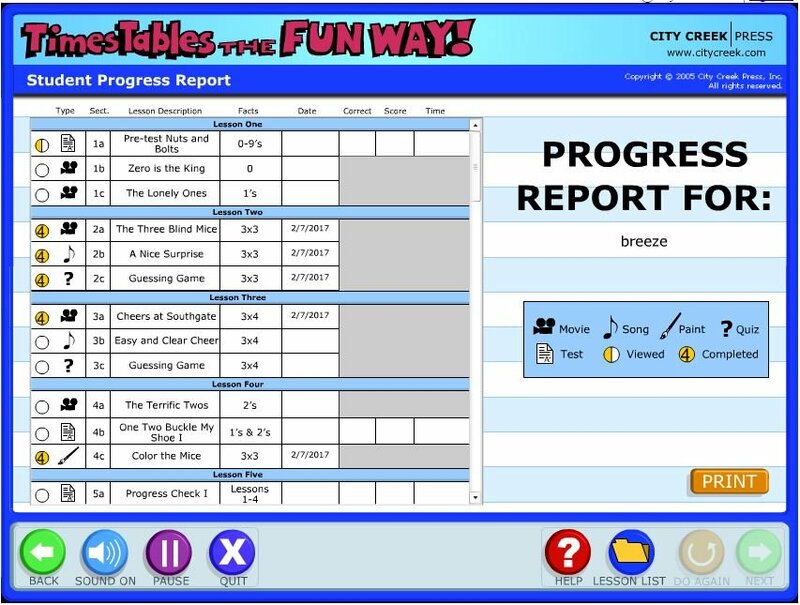 Then comes a mini checkpoint: Breeze is prompted to remember the characters and the facts that are associated with them, and then type the answer. After, she is prompted to type the facts, without the mnemonics. 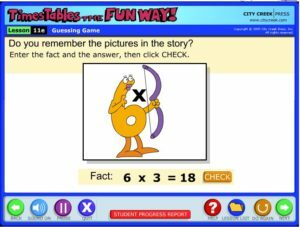 After the lesson, you are prompted to remember the image, and the number fact associated with it. After, you are prompted to remember without the image. After four lessons, there’s a progress check, which you can also print out. There are also games and coloring pages. When you type in a wrong answer, it will keep prompting you to try again. Times Alive recommends that you do the lessons in order. 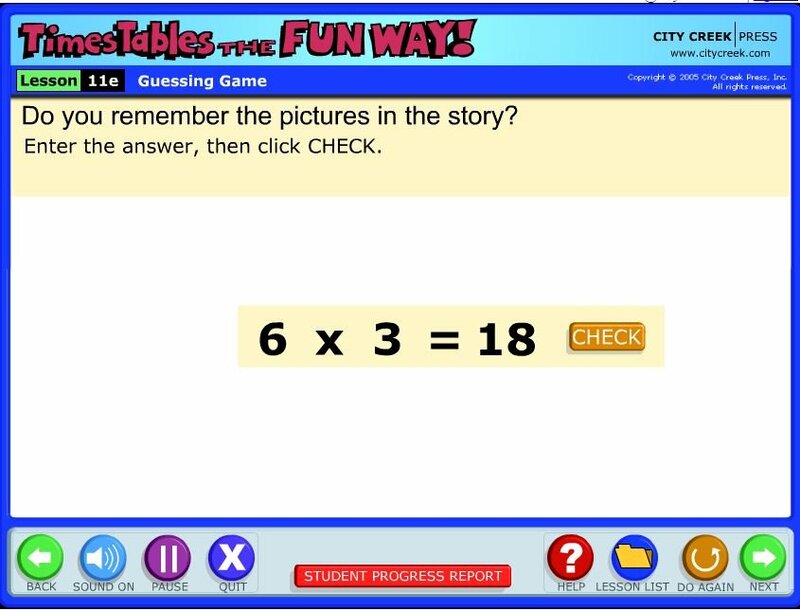 Unless you sit with your student, you won’t know what number fact she got wrong; the system doesn’t track the questions missed. You could also print out the quiz instead. On the other hand, it’s also a good idea to sit in on the lessons so you can also be familiar with the stories and songs. Then you can remind your kids of the mnemonics. Times Alive also teaches some easy techniques for solving, like using your fingers to solve for times 9 problems. The graphics aren’t snazzy or sleek, but the kids enjoy them. The stories and songs may be super silly for adults, and some of the rhymes are a stretch (like ‘blind’ and ‘nine’ in the lesson on 3x3 = 9 using three blind mice). “It’s fun. 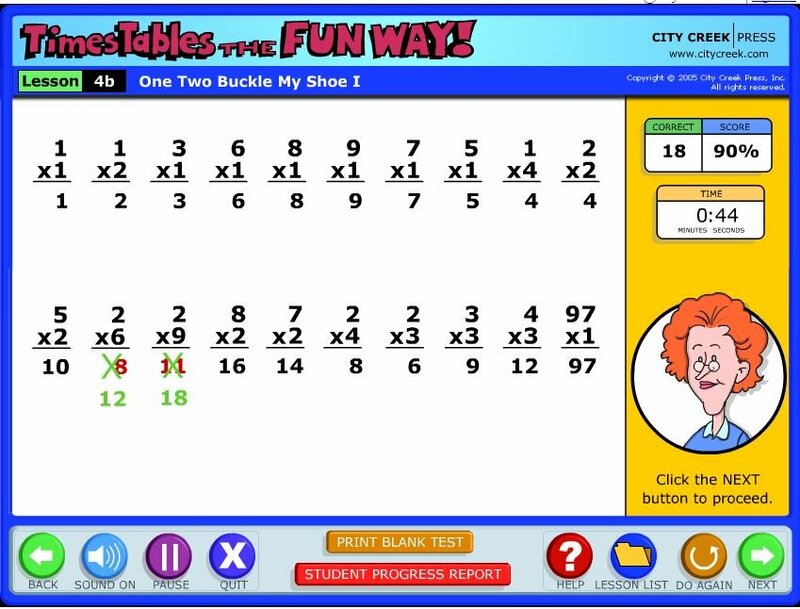 I [recommend] it for anyone who does not like regular multiplication,” says Breeze. I also doubt that you would need to subscribe for more than two months to memorize the times table, so I don’t think it’s a long term type of subscription, so if you do have the budget for Times Alive, go for it! Other moms have used Times Alive too. 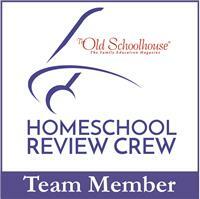 Click here to see what they have to say about it. I like the 6 x 3=18 best, the six hunter who has a three bow and shoots the one arrow at eight Bigfoot (Eightfoot?) . Denise, I don’t think they have a trial period, but subscription is available monthly so you can zip through it in a month 😀 Come over and try it out! I have to ask Breeze to show me this, the characters look so funny nga haha! Kudos to the programmers and animators!